honolulu, Hawaii —The Grammy-winning Honokaʻa High School Jazz Band is performing on Oʻahu this month as part of National Jazz Appreciation Month which culminates in the United Nations Educational, Scientific and Cultural Organization's (UNESCO) International Jazz Day on April 30. 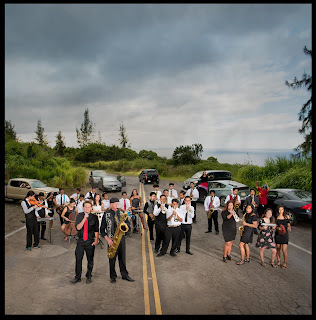 The Honokaʻa High School Jazz Band is a group of advanced music students at Honokaʻa High and Intermediate School. Under the direction of Gary Washburn, dedicated teacher and accomplished jazz artist, the band has long been considered one of the state’s top high school bands and has received local and national recognition for its excellence. The band will perform a series of free concerts on Oʻahu from April 25-28. This year, the theme of Jazz Appreciation Month celebrates jazz beyond borders, exploring how jazz unites people across geography and culture. "These students work together to create something beautiful and meaningful. Music resonates across cultures, languages, and traditions; we've all experienced music's unique ability to bring people together. 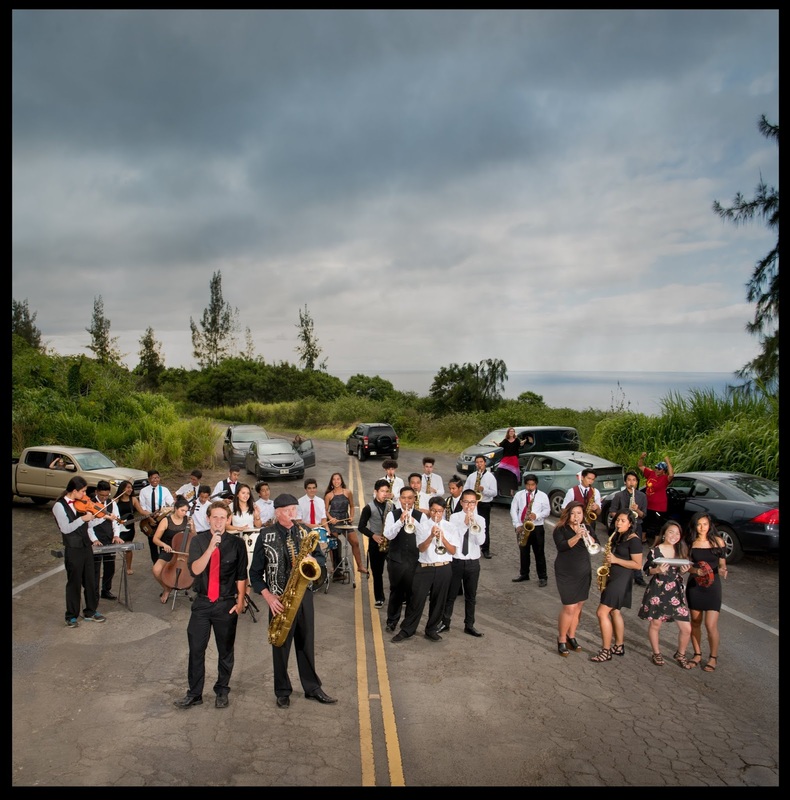 As a music and jazz lover, I'm thrilled that the Honokaʻa Jazz Band continues to share this gift," said Representative Mark M. Nakashima (Hamakua, North Hilo, South Hilo) a former student of Washburn. 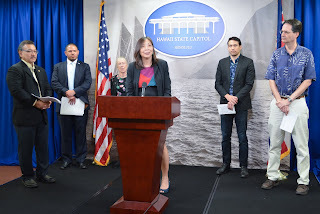 Representative Nadine K. Nakamura talks to reporters about the Legislature passing suicide prevention bills along with other lawmakers and Prevent Suicide Hawaii Task Force members. Honolulu, Hawaiʻi – The Legislature has passed two important measures to help prevent suicide and to bring awareness to a disturbing increase in youth suicides in Hawaiʻi, especially on the neighbor islands. HB655 HD1 SD1 designates September as "Suicide Prevention and Awareness Month" to promote public awareness regarding suicide prevention and education, resources, and support available to individuals, families, and communities. HB330 HD1 SD1 CD1 appropriates $150,000 to the Department of Health to support youth suicide early intervention, prevention, and education initiatives in all counties focusing on youth between the ages of 10 through 24. Representative Justin Woodson, Chair of the House Lower and Higher Education Committee, along with other Representatives, Senators, UH staff and students discuss the bills passed this year to support community college students. Honolulu, Hawaiʻi – In recent years, paying for a college education has become too expensive for many people, and students who are at an economic disadvantage are disproportionately affected. To offset costs for tuition and basic needs, state lawmakers have passed two bills appropriating more than $2.3 million in state funds to help our young people achieve their dream of a college degree. 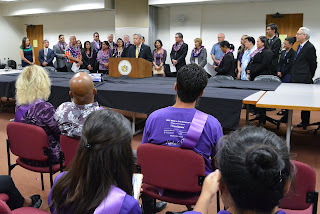 The first bill is SB316 SD2 HD2 – Hawaiʻi Community College Promise Program. 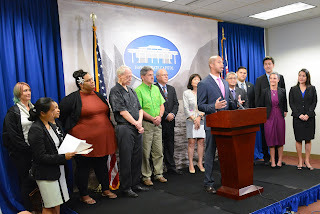 · This bill provides $1.4 million ($700,000 for each of the next two fiscal years) to cover community college tuition for eligible students once all other federal aid and public and private scholarships are exhausted. 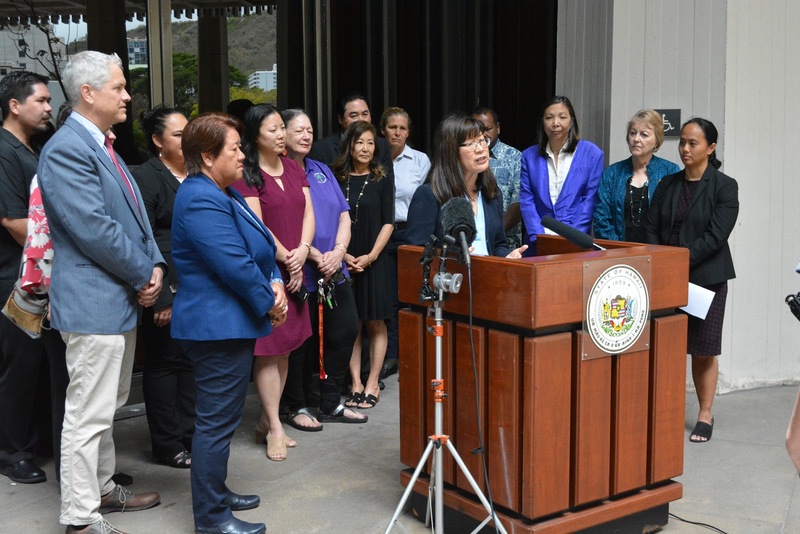 · The bill also requires the University of Hawaiʻi to collect data on how well the Promise Program directly increases the likelihood that a recipient attends college and completes a degree program. House and Senate lawmakers today approved four Kupuna Caucus bills, bringing total funding to over $20 million for elder services in the community. This package of four bills dedicates $18 million to kupuna care services, expands and strengthens the Kupuna Caregivers Program, supports healthy aging in the community, and provides funds to coordinate and improve Alzheimer’s disease and related dementia services in the community. Lawmakers, including members of the Women's Legislative Caucus, collected 432 pounds of gently used professional clothing for the YWCA's Dress for Success program. (Standing, from left) Rep. Della Au Belatti, Rep. Cynthia Thielen, Sen. Rosalyn H. Baker, Rep. Nadine K. Nakamura, Rep. Gregg Takayama, Maryann Bray, YWCA Lead Member Services Associate, Rep. Lisa Kitagawa, House Speaker Scott K. Saiki, Rep. Sylvia Luke, Kepola Dudoit, YWCA resident artist, (seated from left) Rep. Linda Ichiyama (with baby Emily), Rep. Dee Morikawa, Rep. Joy San Buenaventura, and Cecilia Fong, the YWCA Director of Fund Development. 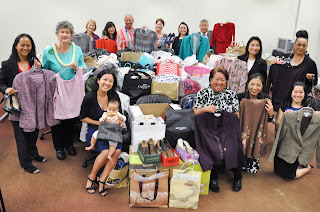 Honolulu, Hawaiʻi – Members and staff at the Hawaiʻi State Legislature have donated 432 pounds of gently used professional clothing, shoes, handbags, and other assorted items to the Dress for Success Program hosted by the YWCA O‘ahu. The items were collected from March 25 to April 10 and presented to the YWCA today. The clothing will be provided to women – many of them formerly incarcerated – making a second start in life with the help of the YWCA. Attending today's press conference on Juvenile Justice bills (from left) were Representative John Mizuno, Chair of the House Health Committee, James Dold, founder and president of Human Rights for Kids, Kat Brady, Coordinator for the Community Alliance on Prisons, Representative Joy San Buenaventura, Chair of the House Human Services & Homelessness Committee, Representative Chris Lee, Chair of the House Judiciary Committee, and Karl Rhoads, Chair of the Senate Judiciary Committee. Honolulu, Hawaiʻi – Lawmakers this week passed bills to protect children's constitutional rights when in police custody and to limit long sentences for minors. "Too little attention has been paid to the most vulnerable casualties of mass incarceration in America — our children," said Representative John M. Mizuno, introducer of both measures. "From the point of entry and arrest, to sentencing and incarceration, our treatment of children in the justice system is long overdue for re-examination and reform." House Bill 217 HD1 SD1 requires that when an officer has custody of a child under the age of 16, the child shall consult with legal counsel before waiving any constitutional rights and before any custodial interrogation. House Bill 218 HD1 SD2 grants the Circuit Court, when sentencing a minor for a nonviolent criminal offense, the discretion to impose a sentence that includes a period of incarceration as much as 50 percent shorter than any mandatory minimum and, in certain cases, decline to impose a mandatory enhanced sentence. Representative John Mizuno (D – Kalihi Valley, Kamehameha Heights, Lower Kalihi), Chair of the House Committee on Health, together with fellow lawmakers and stakeholder organizations formed an initial outline of solutions to address the unique needs of Compact of Free Association citizens in Hawaiʻi. 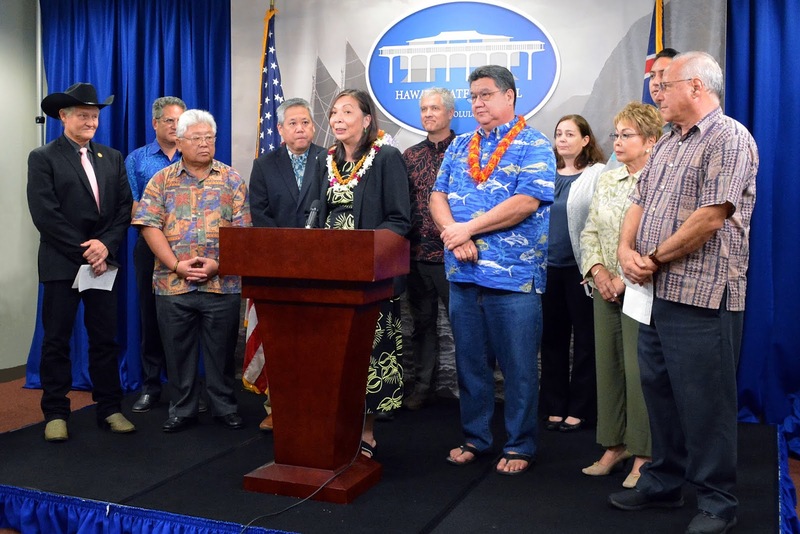 "This is a blueprint for a path in the right direction for both Compact citizens and the state," said Rep. Mizuno. "When Pacific Islanders do well, our entire state benefits." Honolulu, Hawaiʻi – With two days left before the Second Crossover deadline, the House today passed an additional 85 Senate bills. These bills now head back to the Senate for their consideration. If the Senate does not agree to amendments made by the House, the bills will be negotiated in conference committees. To date, 236 bills have crossed over from the House to the Senate. Key measures that passed by the House today includes homeless services, emergency highway appropriations, election reforms, kupuna caregivers funding, ambulance services changes, community college Promise Program support, bail reform, and gun violence prevention. SB417 SD2 HD2 Authorizes the Department of Health to establish fees for transportation and provision of emergency medical services. Authorizes transportation to certain medical facilities and to medical facilities other than hospital emergency departments. SB1423 HD1 Permits defendants for whom a monetary amount of bail has been set to pay the bail amount seven-days-a-week on a 24-hour basis and be released from custody upon posting or payment of bail. House of Representatives Speaker Scott K. Saiki released the following statement on the Water Rights Bill. "The report that the House leadership is pressuring the Senate to advance HB 1326 during its floor session is not true. At this point, it is entirely up to the Senate leadership to determine how it wants to proceed. Whatever the leadership decides, it is important that the Legislature be civil and reasoned, rather than divisive." Representative Cedric Asuega Gates (Waiʻanae, Mākaha, Mākua, Māʻili) submitted an official inquiry to the City & County of Honolulu Department of Planning and Permitting, Board of Water Supply, and Pacific Links International to request permitting information regarding the proposed renovation of Mākaha Valley Resort, and is organizing a community town hall to provide residents with the opportunity to give input on the project. Pacific Links International announced plans to redevelop Mākaha Valley Resort, including creating homes and enlisting professional golfer Tiger Woods to redesign the golf course. Rep. Gates said residents have been responding with mixed reviews. Among concerns are the impacts this resort may have on the fabric of Mākaha's small-town community. On the other hand, many community members shared positive memories of the former resort, touting the past beneficial economic impacts and employment opportunities that it brought to Mākaha. Honolulu, Hawaiʻi – Tourism on the island of Hawai‘i – the island’s leading industry – is receiving some much-needed support with an emphasis on new branding initiatives and increased marketing funding for its two largest markets, the U.S. mainland and Japan. "The Legislature last week approved an additional $60 million in emergency relief funding to repair damaged infrastructure," said Onishi. "But money for infrastructure alone will not fix the damaged economy. That is why I was gratified to learn that the HTA is stepping up to the plate to provide funds to help revive Hawai‘i Island's economy." Honolulu, Hawaiʻi –The House Committee on Health will hold an informational briefing to focus on solutions to improve integrated health care services for Compact of Free Association citizens while prudently using state resources, with a focus on preventive care to significantly reduce costs related to emergency care. The briefing will seek consensus building with state and non-profit agencies to address the unique needs of Compact citizens. 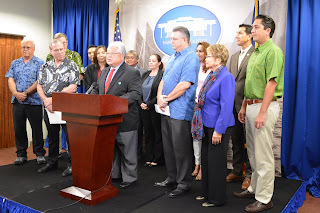 Honolulu, Hawaiʻi – Knowing the tremendous need of Big Island residents following the devastating Kilauea eruption that destroyed homes, farms, and infrastructure last year, lawmakers moved quickly this session to provide financial support by passing HB 1180 HD1. 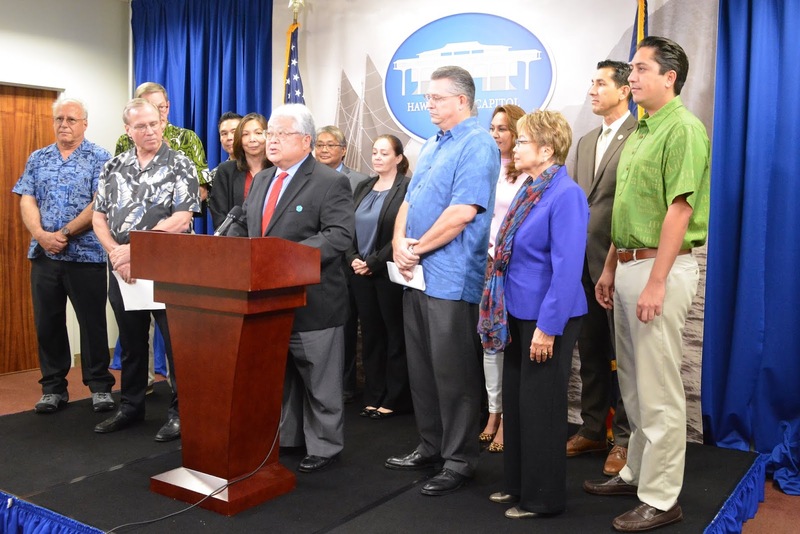 During a press conference today, Big Island lawmakers talked about the road to recovery for Hawaiʻi Island. Representative Cedric Asuega Gates (Waiʻanae, Mākaha, Mākua, Māʻili) is urging West Oʻahu residents to make their voices heard at two upcoming meetings about the proposed Vehicle Miles Traveled (VMT) initiative being conducted by the Hawaiʻi Department of Transportation (HDOT). "The HDOT is looking into the concept of a road usage charge system to generate more funds for road maintenance. I want to clarify that I am against this road usage charge system," said Rep. Gates. "The road usage charge system would charge individuals a tax that would correspond with how many miles they drive each year. Because they drive so far every day, the residents of the Wai‘anae coast would have to pay the highest fees for this new road usage charge system." Representative Sharon Har, in partnership with Kapolei High School, will be hosting the Kapolei Keiki Wellness Resource Fair. We have partnered with businesses and community service providers to create a one-stop shop for parents and families to obtain information on raising healthy, safe, and well keiki. Over 40 participants are confirmed for this annual event. Event highlights include free keiki IDs, vision check-ups, games, activities, and giveaways. Children and families island-wide are invited to attend. 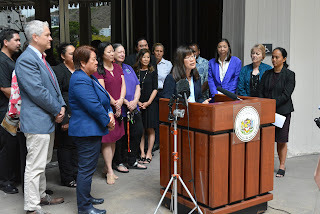 Honolulu, Hawaiʻi – Hawaiʻi Island representatives and senators and Hawaiʻi County councilmembers will hold a press conference to discuss HB 1180 HD1 – the Hawaiʻi Island disaster relief funding bill. The bill is scheduled for third reading in the Senate on March 29. The press conference will be held at 1 p.m. in room 445, immediately following House and Senate sessions. Honolulu, Hawaiʻi – Representative Lynn DeCoite, the Hawaiʻi Department of Agriculture, and the University of Hawaiʻi Cooperative Extension are sponsoring an informational meeting on food safety and Food Safety Modernization Act (FSMA) compliance with visiting FDA representatives Mark Chen, Stephen Hughes, and Stelios Viazis. Agricultural stakeholders have been invited for a meaningful dialogue with FDA officials. Honolulu, Hawaiʻi – The House and the Senate today approved a final version of HB 2 HD1 SD 1 CD1, the state budget bill, which includes operating monies to run the state government. The bill puts a priority on appropriating funds to staff the new state hospital, make needed improvements at state airports, and pay down our debt service. The House Finance Committee and the Senate Ways and Means Committee met in conference last week to finalize the bill. Conferees approved the $16 billion budget covering fiscal years 2020 and 2021 about a month earlier than in previous legislative sessions. Honolulu, Hawaiʻi – Today (March 7) the House of Representatives passed HB1383 HD2, which decriminalizes the possession of three or less grams of cannabis and instead establishes a fine of $200. "This law keeps drug dealers behind bars where they belong, but also keeps regular people who just had a joint out of jail to avoid creating more hardened criminals which makes crime worse," said Representative Chris Lee, Chair of the House Judiciary Committee and introducer of the measure. "It removes the unnecessary permanent mark from their record so they can go back to school, get a better job, and take care of their family. If we want to actually reduce crime and reduce substance abuse, then our taxpayer dollars are more effectively spent on treatment rather than jailing people at a cost of $146 per person per day."